If you’re a regular here at ADC, you probably already know that I love baking. 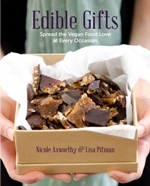 In fact, this blog started out as a way to share my dessert recipes after I returned from an epic week with Fran Costigan at the Natural Gourmet Institute in 2010, full of knowledge and inspiration. Baking has been my jam ever since my stepmom taught me how when I was all of seven years old. Heck, my love for baking experiments even started back then—have you ever tried baking chocolate chip cookies in a muffin tin? I thought it was a brilliant idea at the time, but I was devastated when they came out of the oven looking like rock-hard hockey pucks (I ate them anyway). My first baking lesson: Don’t ever mess with the tried-and-true recipe on the back of the Hershey’s chocolate chips package. JK Gourmet was created by a woman named Jodi who was diagnosed with ulcerative colitis, a life-destroying intestinal disease, back in 2000. She was looking for a drug-free way to treat her condition and soon realized that changing her diet was key to controlling it. Her health journey is what inspired her to create a company with a mandate devoted to making all-natural, preservative-free products. While not all of her products are vegan (she uses honey in her granola, chocolate and other baked goods), I’m so glad I was introduced to her almond flour. Since it’s made up of blanched almonds that are very finely ground, the flour is fluffy and light and far superior to other brands I’ve tried before—plus, it saves me from cleaning out my food processor when grinding my own nuts (hehe). 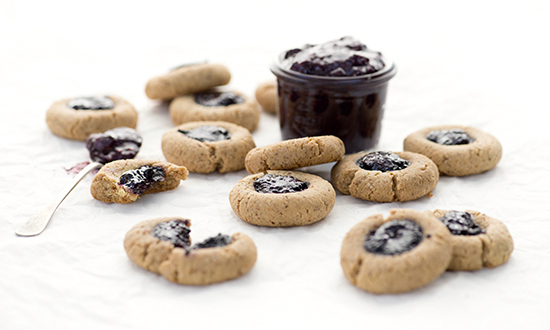 Both the cookie mix and pancake mix are made with just a few simple ingredients: almond flour, coconut sugar, baking soda and salt. The instructions for the pancake mix call for whipped eggs and water, but I gave it a go anyway using flax eggs. Unfortunately they turned out quite dense and stuck to the pan like nobody’s business. I’m thinking egg replacement powder or even that magical aquafaba would have provided better results. I’m madly in love with the almond flour though, and was particularly happy that it came in a resealable plastic bag so it would stay fresh longer. 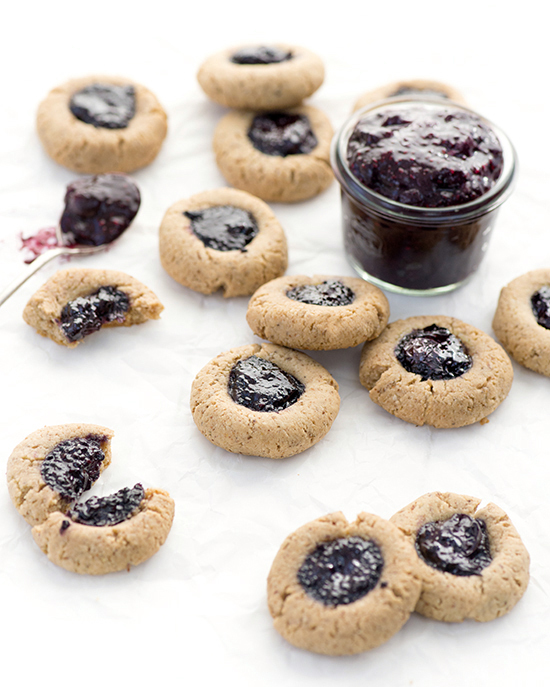 These almond thumbprint cookies with blueberry chia jam are a result of this mild obsession, and if you try this particular brand you’ll realize what a difference it makes to use super-fine flour in cookies and cupcakes—you’ll get a lovely texture without any of the grit, and they’ll be delicious and authentic like they’re supposed to be. I even ran out and bought more to use in my vegan bake-off entry in March. The JK Gourmet brand of almond flour is a little more pricey than others, but I think it’s worth the difference. Of course, the drought last year in California also resulted in significant price increases for almonds and almond-based products [insert sad face here], but sometimes that crunchy, versatile nut just can’t be beat. In a small saucepan over medium heat, stir together the blueberries and coconut sugar. Cook, stirring occasionally, until the blueberries soften and the sugar is melted, about 5 minutes. Add the chia seeds and stir well. Reduce heat and simmer for about 10 minutes, until thickened. Remove from heat and allow to cool. Preheat oven to 325F and line a cookie sheet with parchment paper. 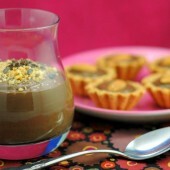 In a large bowl, whisk together the almond butter, maple syrup, vanilla extract and almond extract until smooth. Add the almond flour, flax meal and salt and mix with a spoon until a dough forms. Depending on the consistency of your almond butter, you may need to add a touch of water until it comes together. Using a one-tablespoon measuring spoon, scoop out dough and form into balls with your hand. Place on prepared cookie sheet and use your thumb or finger to make an indent in the centre of each ball. Fill each well with jam (I used about 1/2 teaspoon each). Bake at 325F for 18 to 20 minutes or until cookies are dry to the touch and the bottoms are golden brown. Allow to cool completely. 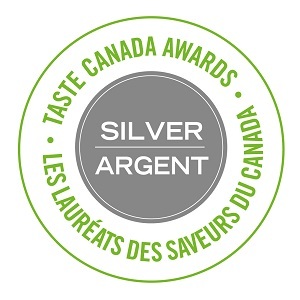 I’m thrilled that JK Gourmet is allowing me to give away the same product pack I received (a $50 value!). If you’re a baker like me or just want to give these grain-free, gluten-free and vegan mixes a try, enter using the widget below. The giveaway will run until 12 a.m. EST on Wednesday, April 29, 2015 and is open to Canadian residents only (sorry, my international friends!). 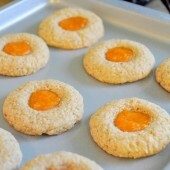 Those thumbprint cookies look absolutely delicious! I have yet to find superfine almond flour, so I don’t have a favorite use for it yet. However, I do use almond meal and plain old regular almond flour, and my favorite thing to do with it is vegan frangipane. It’s sooooo good! I love making bread with almond flour. 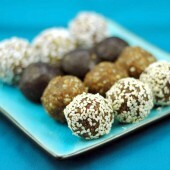 I love using almond flour in raw desserts like cocoa balls or brownies! i haven’t use almond flour but would love to win some so i could try it. I have not used it yet, but would like to. I love using almond flour in baked breads. 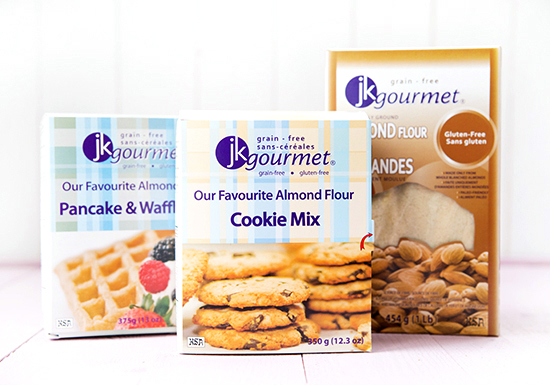 I am so intrigued by the fluffiness of the almond flour – I am super-stoked to try this JK Gourmet product now! What a great giveaway for what sounds like a really awesome product! 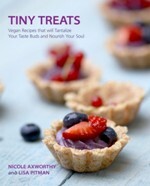 And absolutely gorgeous photos and a super fun writeup (love the cookies in a muffin tin story!). I love, love, love that the almond flour is blanched. I recently discovered almond butter made with blanched almonds (as opposed to the usual roasted or raw) and it is like liquid marzipan. 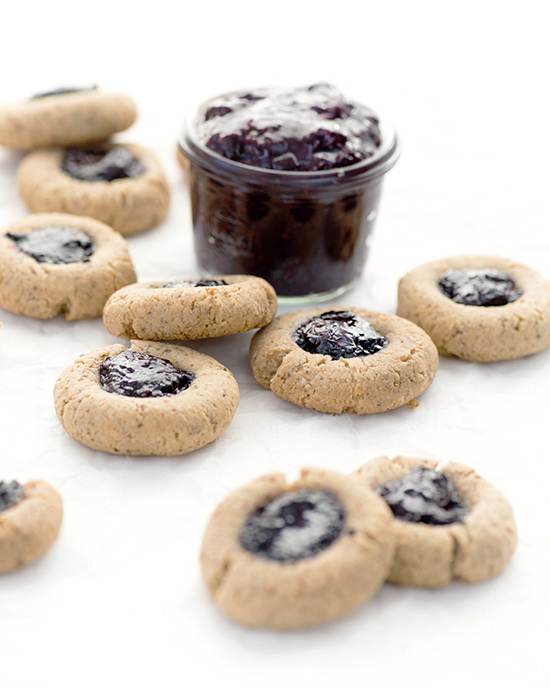 My favourite way to use almond flour is in cookies, chocolate chip in particular—it makes them so tender. I bet this flour would be spectacular. 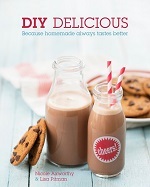 i’ve used it to make mexican hot chocolate cupcakes. I haven’t tried almond flour yet, but hopefully I’ll get the chance to! This recipe looks Delish! I love almond flour in my cookie dough balls! 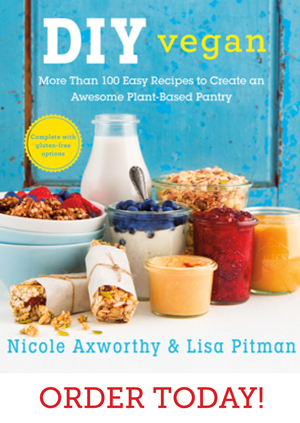 I love using almond flour for healthy banana bread and nutrient dense cookies! 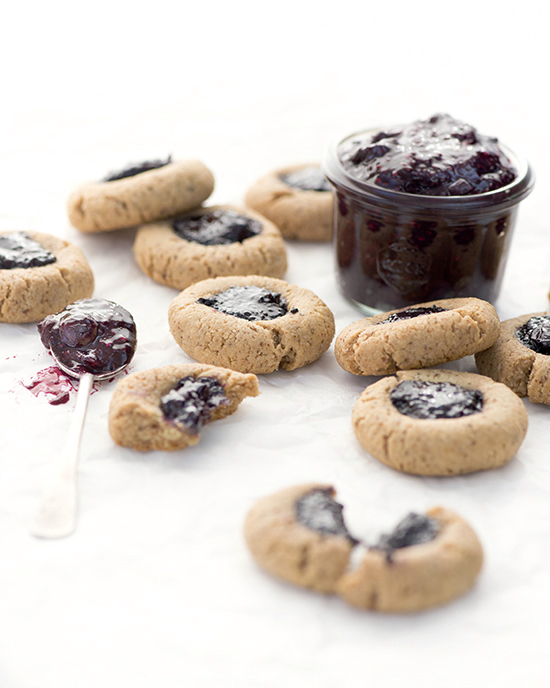 I have tried almond flour a few times to make cookies and muffins!